In May 2012 a disaster struck the Reggio Emilia region; an earthquake rocked through the land, the consequences would be far-reaching, taking years to re-establish their famous food product, Parmigiano Reggiano. I wrote a short piece in the Guardian on the subject, and four years on life and work have come together and as they say, life goes on. Our affection for Parmigiano Reggiano has, on my part at least, been somewhat obsessive. Anyone who knows me understands that I have to get ‘under the skin’ of the product to appreciate where it comes from, who makes it, how it is made, asking question after question. But I am not always sure those working with me understand why I go to lengths to get what I consider a definitive product be it cheese, wine or even salt and pepper. After the earthquake we had long talks with our cheesemaker assessing how we would continue and what cheeses would be available. He finally called us towards the end of 2016 saying that he was going to join another production unit and close down his small facility. He wasn’t admitting defeat but I could glean that he wanted to make more cheese and be more productive. His family is growing up and I can understand that he wants to lay the foundations for them to join him and his business partner in their new premises. Now, I thought, this is the time for a visit and to bring back different makers of Parmigiano and have a blind tasting back in London. We are going to have to wait a year before we can begin again with our current cheesemaker, and it was an opportune moment to visit his new facility and also explore the region a bit; just 2 days and one overnight stay – just the way I like to do these trips – full concentration and no diversions! Hammering Parmigiano-Reggiano. Photo: Patricia Michelson. Maturing facility. Photo: Patricia Michelson. Cheese Shop in Bologna. Photo: Patricia Michelson. First flight out to Bologna Marco and I arrived to be greeted by pouring rain that would stay with us for the whole day. We go through my list (all my notes are on postcards) and decide that we will go to Reggio Emilia first. The following day we will explore Bologna in the morning and then visit our producer and one other. All I hear about Parmigiano at the moment is ‘mountain’ cheeses, which is not entirely correct. The dairy can be 500m up a hill to qualify in their eyes as ‘mountain.’ I’ve always said that my favoured cheeses are close to the River Po and low number dairies. I like early months —January, February, or March — although ‘mountain’ cheeses are often really good towards the early summer. The feed is so specific from the drying of the grasses to the growing of the legumes and grasses with seeds that you almost feel there is a masonic secrecy to this cheese. One thing is certain as far as I am concerned: I want to work with a cheesemaker who is using milk from local farms; who oversees all the elements of feed; who processes the milk to make enough cheeses (but not too many) in order that he can pride himself on making the best possible cheese; and the Consorzio-listed maturing unit – where wheels are stored alongside other local producers' cheeses in cooled ‘hangars’ and where, these days, robots lift and brush the cheeses day in and day out ensuring the outer crusts are smooth and mould-free – should preferably be close by. Driving through this region known for its agricultural produce the land is mostly flat until, on the horizon, you see the landscape change; a backdrop of mountains rises up, more like wistful brushstrokes than harsh forbidding craggy rock faces. It always amazes me that the people really don’t know what is going on from one town to the next; they are locked into their own little world and this very Italian mentality is the reason their produce is so unique and special. They are not comparing or competing, they are simply making the best possible product. For instance, we were invited for lunch by the owner of a maturing unit in the Mantova area. The restaurant had the usual suspects on the menu, like Tortellini in broth, which I duly ordered. “Ah,” said our host, “now I want you to taste it just how we ‘artisans’ like it.” When my bowl arrived he took the bottle of really wonderful crimson Lambrusco and poured some into the bowl. “Now this is what I have at the end of every day when I come home from work starving hungry – my mother said this will revive you!” I have to say it was truly delicious, but only in this part of the region you will find the broth served this way. So I come back to London with seven different Parmigiano. One is from our usual producer who gave me the last piece of 36-month to enjoy until we start up with him again next year. All the others we have picked up along the way – from the local covered food market in Bologna to cheese shops and grocers to another medium-sized producer; one particular one the number of which I seem to remember, but from where I can’t put my finger on. They’re all lined up – we’re blind tasting. What fun! The boys can’t wait and actually start without me as I am called away to take a phone call. By the time I come back, they are discussing, assessing and very animated. “I like No. 1 and 3” …. “No, No. 4 is the best and No. 7” …. "They all taste the same to me” (I think that remark was supposed to be ironic). So I taste. No. 1 is okay – pleasant with some acidity. No. 2 is drier but may work with a glass of Prosecco or that great Lambrusco I remember from the lunch. No. 3 – that’s sweet and light fruity acidity. No. 4 I don’t like at all. No. 5 – bland. No. 6 – too grainy. No. 7 — that’s probably my favourite. But I keep going back to No. 3. What is it about that cheese that sparks my memory? I’m given the list. No. 3 is Dairy 993 – apparently it’s won all sorts of awards and is a hillside producer. 993, 993, why do I know this number? (By the way No. 7 is the producer we work with.) I go into my office and take down my first book, The Cheese Room (published 2001); I flick through the pages to the pictures, hoping they might spark my memory. 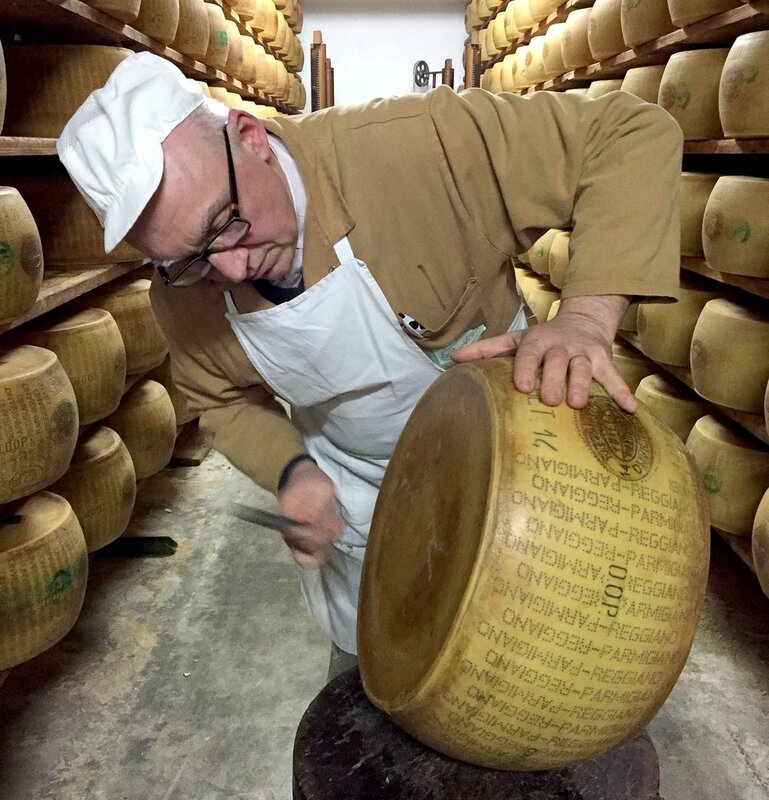 And there it is, a picture of me opening “the mighty Parmigiano." No. 993 Toano Dairy! Yes it was the cheese I brought in when I started working with Italian cheeses some 23 years ago; we stopped when we had a few problems getting the particular months we wanted and I subsequently fell in love with the cheese we get now and stayed with that one. But how strange, and again how magical that my taste buds have memories as I do believe that all our senses contribute to enjoyment. It’s good experience for everyone working with cheese to taste through a classic like Parmigiano and see how it changes and evolves and why we might like one more than another. The terroir tells us everything and disperses its goodness in different ways. It may be ‘just cheese’ to many people, but for us it is the reason why we like what we do, and why we love to talk about it, discuss it and continually grow with confidence and knowledge.